We are proud to offer our students state-of-the-art media center services in our MS/HS library. Whether they’re working on a school project, looking for a quiet place to study, or catching up on their independent reading, this is the place to be. 7:30 a.m. to 2:25 p.m. every school day. We are located on the first floor of the Middle/High School Building. Students must get permission from Mrs. Marche after 7:30 a.m. in the morning to use the library during the school day. Teachers, please call Mrs. Marche (4211) before sending students to the library. Teachers can schedule classes in the library by scheduling with the librarian, preferably a week in advance. We expect students using the library to be courteous and quiet at all times. We will ask students to leave and/or revoke library privileges if they do not obey these general principles of good behavior. Be quiet; sit and do your work. In the library, students may not use personal stereos, eat or drink, converse from table to table, move chairs from table to table, or disturb others in any way. Do not damage library furnishings or materials. Students may sign out library materials via computer at the circulation desk. Books circulate 10 school days with the option to renew for 10 more days. Pamphlets and back issues of magazines circulate for 10 school days with no option for renewal. Students may sign out current issues of magazines for overnight use after school, and return them before homeroom the following day. If a student loses a book or magazine, he/she must pay to replace it. Students may check out eBooks online or through the Follett Reading App on your iPad or Android 3.0 or higher tablet.The loan period is two weeks. After two weeks, the title will automatically return to the library catalog. Stop in the library to acquire a username and password or for more information. The Ridgway Public Library also offers eBooks. For more information, visit the Ridgway Public Library website. Accelerated Reader is a reading incentive program offered by the Ridgway Middle School. The program aims to promote reading for all students. Students must meet an individual point goal by the end of each nine-week period. Students who reach their reading point goal are eligible to attend celebration trips. 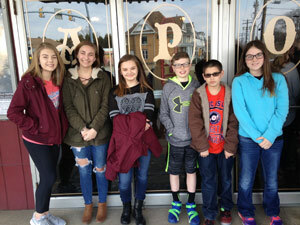 The trip for the third nine weeks was to the Apollo Theatre in St. Marys. Pictured are some of the eligible students entering the theater. A fun time was had by all. Our knowledgeable librarian is always available during regular library hours to answer questions and assist students. Visit our online catalog to search and locate books and materials in the school library. Questions about using these resources? Our librarian is happy to help!